We are the leading company in Poland offering products and services of the high quality steel or aluminium products. 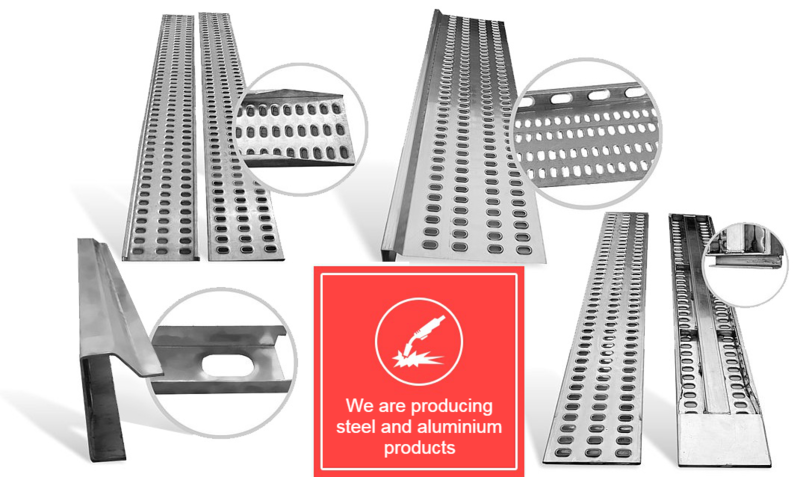 We are producing perforated sheets, aluminium or steel profiles and panels, wheel chocks for any vehicle transporters, reinforced ramps, with handles, etc. We are a company that can be proud of the broadest experience in the industry, as we were the first producer and service provider of the kind in Poland. Many years of practice in production of perforated sheet, connected with perfectly equipped, modern machinery facilities, have made our products respected among multiple national and foreign contractors. We also accomplish services in the field of: cutting sheet to the thickness of 4mm, bending sheet on the bending brake, welding steel and aluminium, embossing and cutting out on the eccentric press, creating tools for cutting out and embossing. Many years of practice in production of perforated sheet, connected with perfectly equipped, modern machinery facilities, have made our products respected among multiple national and foreign contractors. Thanks to our profesionalism we gained trust of our clients, including European biggest transport companies, have appreciated the quality and precision of realization of our products, which even smallest elements are precisely refined. Since we started producing we tried to made high quality products. Our clients have appreciated the quality and precision of our realizations. Since the very beginning of the company’s existence we have relied on the investment in human resources and selecting appropriate staff. Our employees make a good team of highly qualified professionals who enable realization of even the most sophisticated and unusual orders. Our clients may depend on reliable consulting and aid in choosing products reflecting best their expectations.